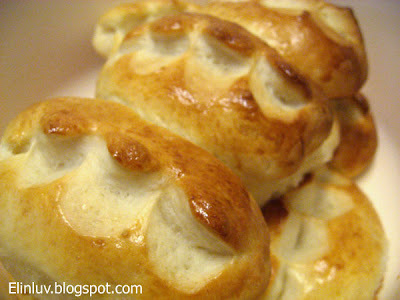 Aaahh…finally back to baking buns again. Guess I can’t stay away from buns making for long…heehee , am really addicted to the freshly baked bun smell whiffing from the oven. 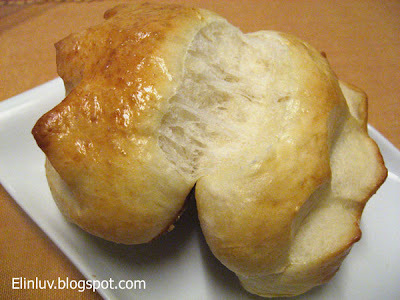 I love the smell of freshly baked buns…I really feel great inhaling those aromatic smell of baked buns and the smell lingers even after the buns disappeared into our stomach. 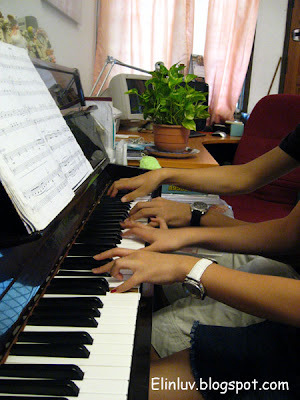 It was worth all the sacrifices to send them for their piano lessons, as I now see them play duet on the piano. It was never easy to play duet but they did it and it brought back memories of yester years when Momsie had to sit with them to see that they practice their pieces and had done their theory homework.... and today, I am sure they are glad that their preseverance through their ten years of learning how to play the piano paid off as they can sit together and play duets. *** I can't help stealing a shot of the most treasured moment in my life, watching them seated at the piano playing duets and finally I was able to enjoy their playing ^____*. Juz wanna share here how happy I am to receive this smses from my Piggies. They have not forgotten Momsie’s birthday ;))))))))))))) ( smiling the whole day) Enjoy all this while it last….. Piggy Ernest famous line…. 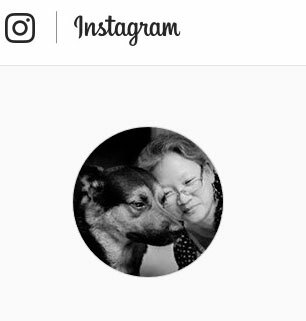 I slept well last night, most probably grinning the whole night thru and woke up beaming this morning becoz they remembered Momsie’s birthday! HAPPY BIRTHDAY!! I m the first….things will be better this year…. 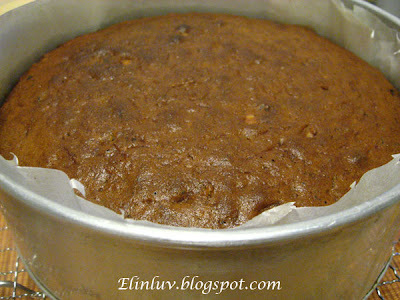 The night before , I baked for myself a carrot cake from Baking : From My Home To Yours ” by Dorie Greenspan . 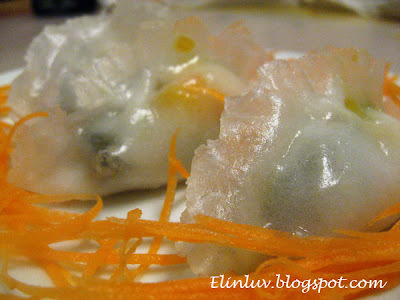 Simple to make and very delicious . 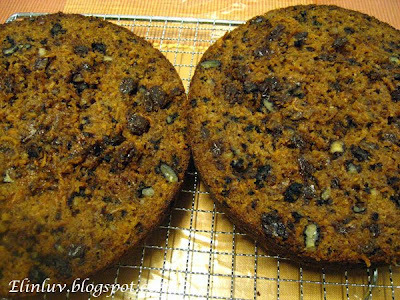 I reduced the sugar by halve and used Muscovado sugar instead of castor sugar and I used melted butter ( 125 gm butter – melted) instead of canola oil. Haha, guess I like to twist the recipe to my taste. 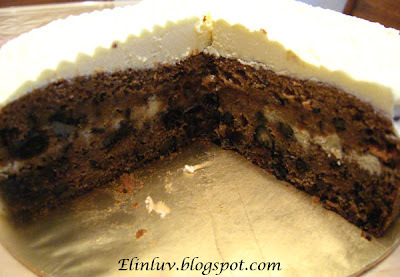 I don’t like my cake to be too sweet and the muscovado sugar will give the cake a coarser and darker texture as you can see from the photos. I normally reduced the sugar by half, depends on the type of cake. 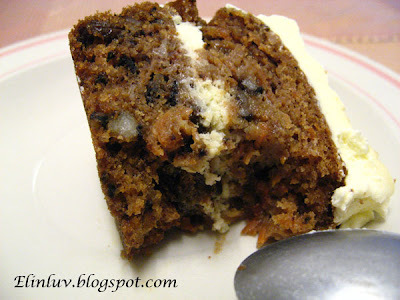 Carrot cake has got raisins and the cheese frosting is slightly sweet ( I reduced the icing sugar by half too ) . 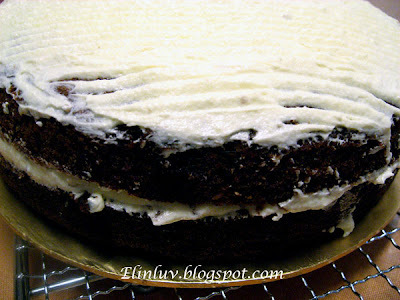 In one and half hours, I got the cake baked and frosted. ** Shout out to My Piggies & Piggy Ernest – when you guys are back this weekend, we will have a big party..most probably this Saturday…BBQ ????? Thus, last night, I had the opportunity to test it out. After watching “ Moonlight Resonance ”a HongKong TVB drama , ( I am watching this drama at the moment – a good drama indeed and the casts are all my favourites – thus, I am glued to the idiot box most night – lesser baking I guess, kidding :p ) Daddy and I were feeling hungry after the drama coz we both had light dinner of ‘Fried Koay Kak ’ , a kind of rice cake. shredded carrots and chopped spring onions. 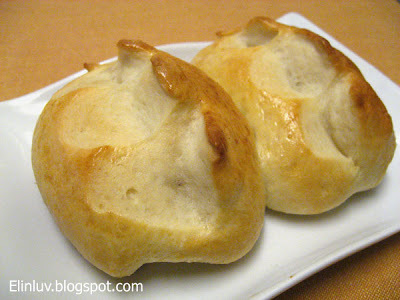 Pour in hot water to wheat and potato starch until half cooked. Knead into a dough. Divide into equal parts , each 15 gm. Roll into a flat disc. Steam over high heat for 5 minutes. 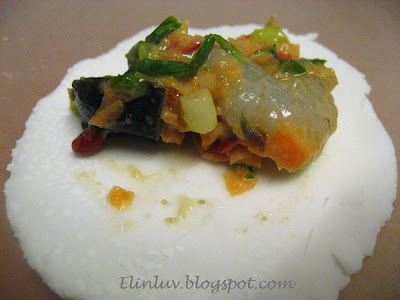 * Note: I tweaked the fillings a bit, added century egg, scallions & shredded carrots. Get everything ready before you start on the dough coz the dough will dry fast. 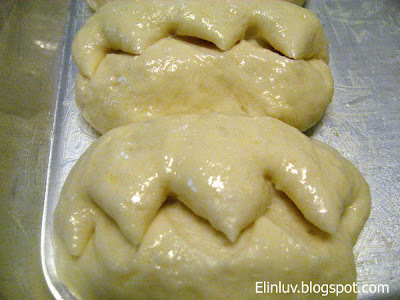 The dough should be soft and slightly moist. 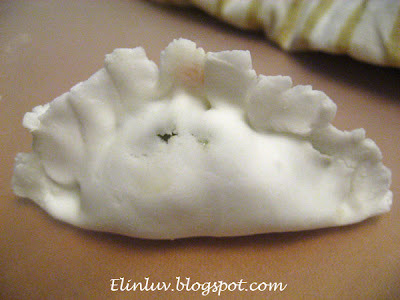 Cover the rest of the dough with a wet towel while wrapping the dumpling. 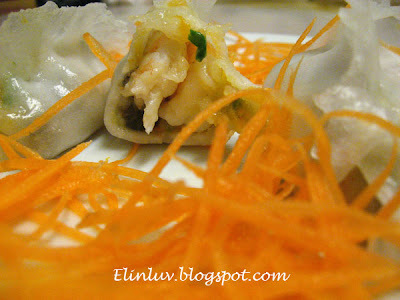 Do not oversteam the dumplings to avoid the dumpling from cracking. 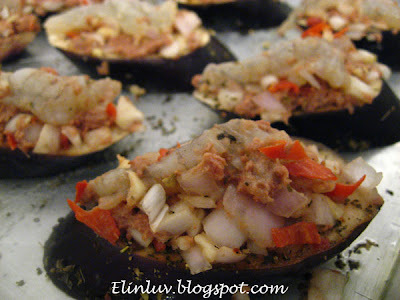 I love aubergines and I have read from many blogs the different ways of preparation. And I came up with my own creation :)) I was thinking , whether to juz stir fry it with prawns or juz steam it and add fried onions on it and eat it simple. But the creative mind starts to work overtime . 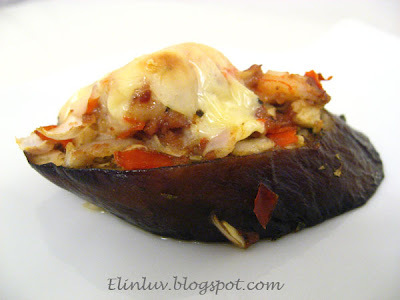 Yessss…why not baked the aubergine with some corned beef as toppings and to make it cheesy , add cheddar cheese…hmmm a very good idea and I can imagine already how it would taste like before I even gathers the ingredients together. Of course, fantastic is the word and the cheddar cheese blends well with the Italian herbs and corned beef….DELICIOUS! Grease the baking pan with olive oil. Place the slices of aubergine on the greased pan. Sprinkle some salt and Italian herbs on the surface of the aubergine. 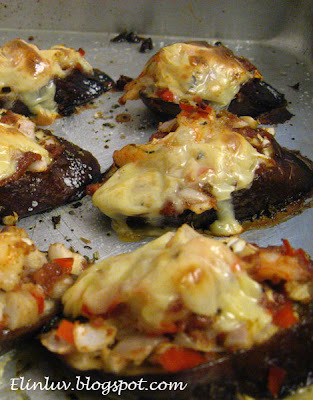 Put a tbsp of A on top of the aubergine slices. Top with a prawn each and some cheddar cheese on top. 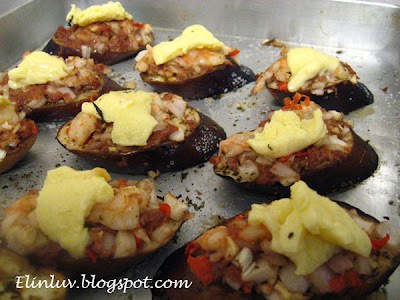 Put into the hot oven and baked for 25-30 minutes till the aubergine is cooked. We had shoulder lambs , chicken wings , pizza sausages and prawns for our BBQ nite on the 1st day of Raya ( told you looks like this year we are taking advantage of the festive season to have BBQ coz the whole family was able to be together again and that was FUN. I enjoyed the fellowship very much too. We normally had it on Christmas Eve but becoz everyone managed to get off during this festive and were back together , we took the opportunity to have charcoal grilled feast for dinner . It was good. 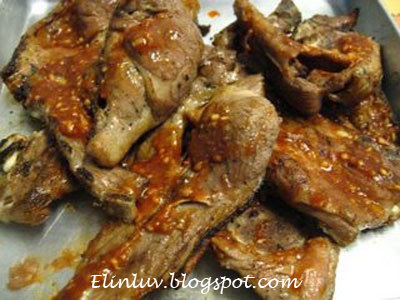 Daddy made his special BBQ sauce and it goes well with the grilled meat especially the shoulder lamb….it was finger-licking good but, of course , it was also artery clogging bad for our health (“,) . We only eat this once a year so I guess it was okay to indulge in this sinful mouth-watering meat. I made a bowl salad to go with the meat and it was good too. The Pizza Cocktail Sausages was even better for it was a first time for us. Piggy Ernest bought it from Jusco..hmmm didn’t know it tasted so good. We had a wonderful time tucking in the charcoal grilled meat plus the fantastic Daddy famous BBQ sauce which I will be sharing with you later. Not much pictures here coz either I was busy eating or busy bbq-ing the meat . 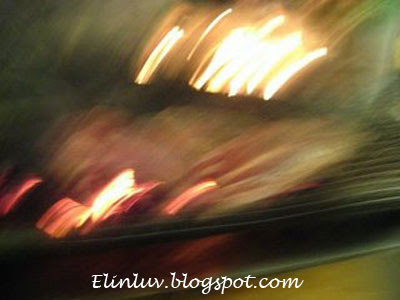 We took turns taking care of the meat while they were being grilled over the amber charcoal. Wash & drain dry all the lettuce and cut it to bite size. Peel the cucumber and cut into half length wise and removed the core . Cut vertical into semi circle strips. Cut the carrots into strips and scald in hot water for a minute ( if you want it to be a bit softer ) hard to chew on raw carrot for older people like me :) . Cut the tomato into half, easier to bite…children won’t get choke on it. 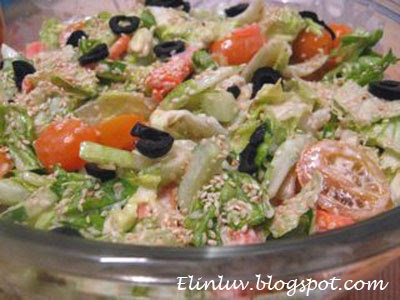 Put all the vegetables and cut black olive into a big salad bowl. Add in the salad cream and olive oil and cheddar cheese and toss till well mixed. 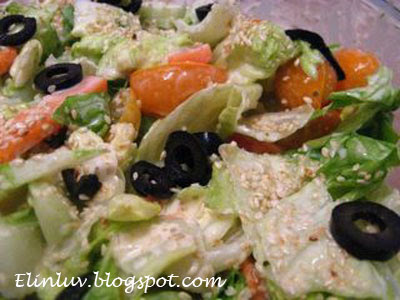 Sprinkle the toasted sesame on top. Serve together with the BBQ meats. We had some left-over steamed crabs when we had our seafood feast during the Raya festive and since everyone had enough of them, I decided to flake off the meat and kept it in the freezer for further use . Beat up the egg with a pinch of salt, pepper. Leave aside. Meanwhile , saute the garlic with a tsp of canola oil till fragrant on a non-stick pan on medium heat. 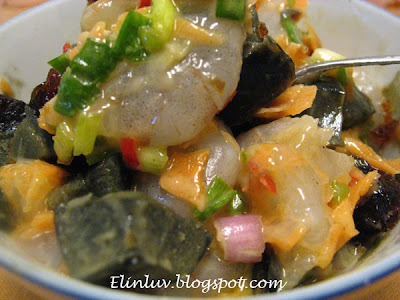 Add in the crab meat and stir fry a few seconds. 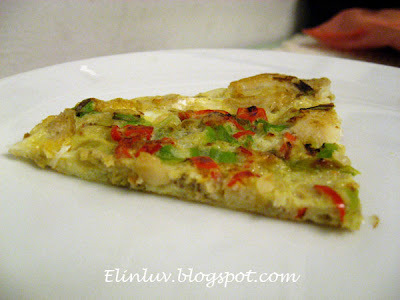 Take out and mixed together with the beaten egg. 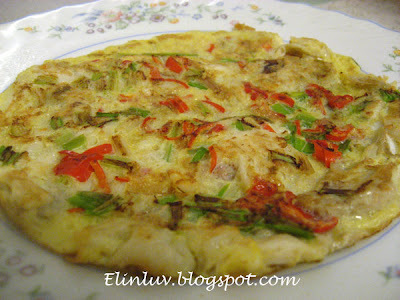 Pour back the egg mixture on the non-stick pan and add in the cut chilli and scallions. When the underside is lightly brown, flipped over and cooked till the other side is lightly brown. Take it out and served hot. Well, I have been enjoying my Raya holidays with my Piggies and the best part was , my boss approved my leave during the Raya festive thus a long stretch of holiday ( normally the nons will not be allowed to take leave ) :) And Piggy Ernest took leave too so we had a wonderful time together. From brunch to dinner , we ate out most of the time. We had a jolly good time together , no doubt. From BBQ , Seafood feast , Japanese food to Night Market (Pasar Malam) food ( can you believe we spend about RM100 just for dinner from the night market ? (pasar malam) We went to the 1st Garden night market (pasar malam) and to my disappointment the food was not good at all. The one near Tesco is much better. More choices of course and more organized. 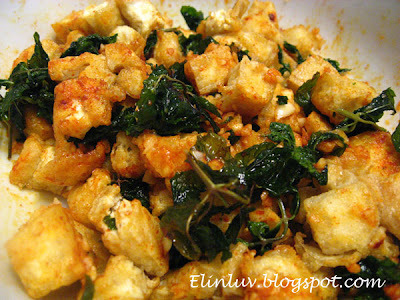 As for me, I love the fermented Tofu and one type of special deep fried tofu with mint leaves…it’s heavenly. I have been yearning for this special tofu since I eaten it a week ago . I watched them as they prepared it and mentally figuring out how to do it since. Thus ,this post on this special tofu. It turned out quite like the one selling at the pasar malam, The only difference is their tofu is specially made for them harder in texture and more flavorsome, whereas mine was softer and bland. 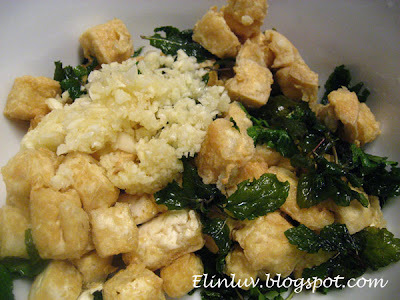 Anyway , it tasted good except the tofu is softer than the one sold at the pasar malam ( night market ) . The finish result after tossing all the ingredients together . Heat up oil in the wok and deep fry the coated tofu till crispy. 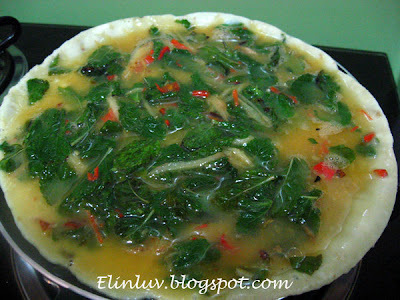 Add in the mint leaves and scald it till half cooked. 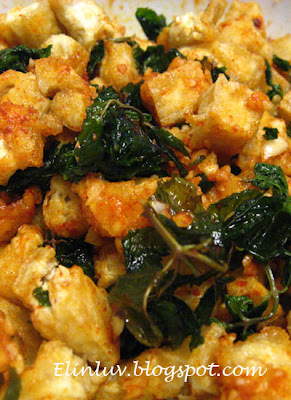 Take out the tofu and mint leaves together and place them in a big bowl. 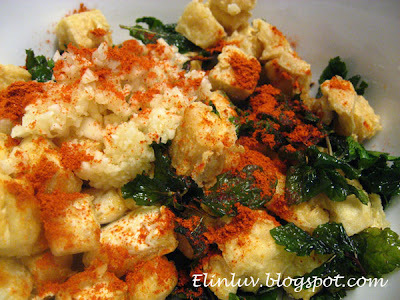 Add in the garlic and sprinkle the chili powder and white pepper to the tofu mixture and tossed it till well mixed. If it is still bland , sprinkle some salt to taste. a simple and delicious snack. 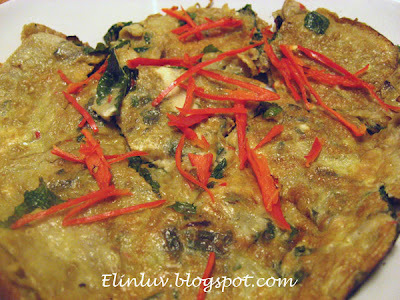 This omelette is easy to prepare and lotz of goodness in it and grandma told us that it removes wind from our body and has a lot of medicinal values to it. Beat up two eggs, add a dash of white ground pepper and a pinch of salt to it. Julienne some ginger and chilli padi ( bird’s eye ) and chopped up 2 pips of garlic. Heat up some sesame oil in a non-stick pan, add in the julienne ginger , chopped garlic , chilli padi till fragrant. Add in the washed and drained dry mint leaves. 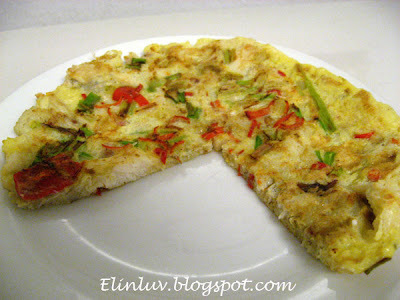 Fry a minute, take out all the ingredients and put into the egg mixture. Stir and mixed well. Then pour the mixture into the non-stick pan till it is cooked properly. 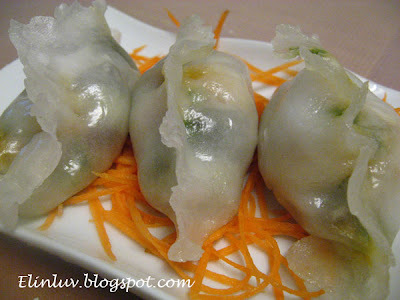 Flip over the other side and when it is lightly brown, dish out onto a plate and garnish with some julienne chilli.